Potato gnocchi at Italia Trattoria. Our region is brimming with a wide variety of vegetables and fruits — it's fair to say that the Inland Northwest is second only to California in terms of agricultural bounty and diversity. While we're able to (and do) grow just about anything, Washington is ranked No. 1 in the nation for carrots, green peas and sweet corn, and No. 2 for asparagus, potatoes and onions; our neighbor Idaho isn't far behind. Local chefs are well aware of how fresh and locally available these crop resources are, and often feature them as the backbone of many dishes on their menus. Chef Anna Vogel's potato gnocchi at Italia Trattoria has been on the menu since the Browne's Addition spot opened, and is a favorite of many regulars. For the uninitiated, gnocchi is of Italian origin, usually a cross between a pasta and a dumpling, but with many regional versions. Gnocchi has been around since Roman times, but potatoes weren't added until they came to Europe in the 16th century. Today, it's indispensable to Vogel's kitchen. "The potatoes add warmth and depth. They are very satisfying, little delicate pillows," she explains. "The potato gives such a rich flavor to the pasta with the addition of the fresh, savory, snappy flavor of the tomato sauce. The addition of the housemade mozzarella adds a creamy, delicate surprise. It is such a comfort dish... We have done other variations of ingredients through the years; we have had creamy sauces, mushrooms, prosciutto and more." Still, the gnocchi is a menu mainstay. "Anna took some time before we opened the restaurant, getting the gnocchi just right," adds Bethe Bowman, Italia Trattoria's co-owner. "Her gnocchi is so delicate and fluffy, not gummy and overworked like so many other gnocchi done badly. 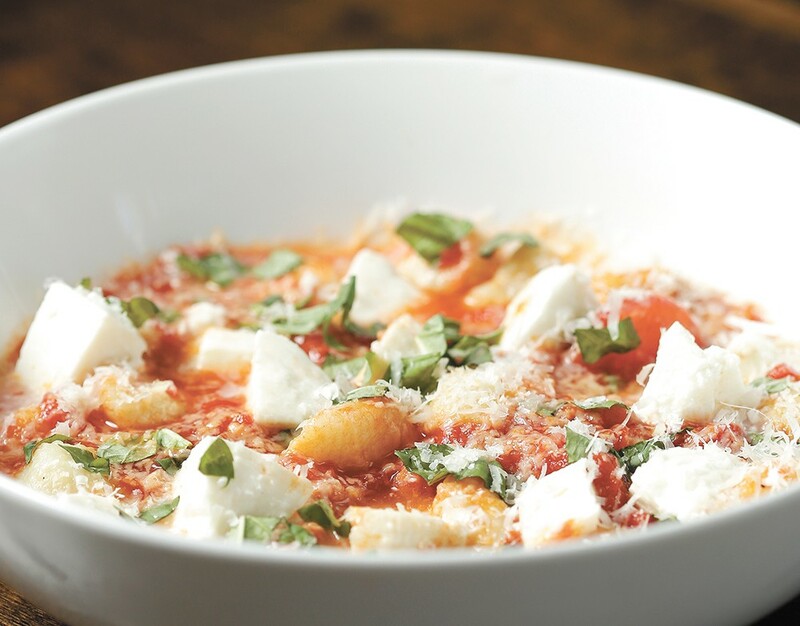 We have a very big following of folks who dine at Italia and order the gnocchi every time." Clover Chef Travis Dickinson used some green inspiration for his menu this year. "Through the spring and summer, we ran a really nice green pea ravioli. The housemade pasta is filled with a mixture of green peas, spinach, mint, tarragon and lemon, sautéed in white wine, puréed and mixed with a housemade ricotta cheese," he says. The ravioli is cooked in a simple wine and butter sauce with asparagus, snap peas and shallots, and served with a watercress and hazelnut pesto, Dickinson adds. The dish is topped with more house ricotta, shaved radish and pea shoots, as well as candied hazelnuts and a bit of citrus-infused olive oil. "It is a pretty simple pasta dish, but we love that it highlights that spring and early summer harvest with both the pea and asparagus components. The mint and tarragon in the filling play very well with the peas. There is a strong citrus component to the dish to balance the richness of the peas that comes from both the citrus oil and the ricotta, which we make with a good amount of fresh-squeezed lemon juice. The watercress adds a nice bite of spice to the dish as well." Part of the challenge of cooking with the seasons is knowing when to change course. Clover's fall menu debuts on Oct. 11, and as it does, this dish goes through a metamorphosis. "This dish was one of our spring and summer favorites at Clover. We will be sad to see it go, but we are always excited to welcome in a new season and a new round of fresh, local ingredients," Dickinson says. "Our fall menu will feature a winter squash and mascarpone ravioli with sherry and sage brown butter, amaretto crumble, chevre, pear, apple and candied pepitas." Try Clover's green pea version while you can, and get ready for the fall harvest highlight. If you're looking for an excuse to visit Pullman, search no further than the Black Cypress, where chef and owner Nick Pitsilionis has performed a little onion magic that's worth writing home about. If you ask about Black Cypress' house specialties, someone is bound to mention the carbonara, an Italian dish with a plethora of versions — all of the traditional recipes include eggs, hard cheese and pasta (and, some will tell you, bacon). Pitsilionis' version also includes a fascinating ingredient: garlic and onion confit. "We confit onions — basically cook them until meltingly soft in neutral oil — then purée them along with garlic confit. This is the base for our carbonara sauce. We have great onions and garlic locally, and they cook down rich and sweet if you let them," he says. Readers may be familiar with confit in reference to duck, but it's a French word which means "to preserve." A confit describes anything cooked slowly, on low heat, as a method of preservation. "We add some nice local eggs with really red yolks, Parmigiano-Reggiano and, to the dismay of our Italian friends, cream," Pitsilionis continues. "Finished with our house-cured bacon, this is our most popular pasta."